Celia, Anne and Jane are triplets that have powers. Anne can see someone's future, Jane can see their thoughts and Celia, their past. Celia thinks hers is more awkward than useful though. It's hard pretending you don't know things about a person, and how could it help them. People remember their past. Lo doesn't though. Celia isn't sure what Lo is, but she was a haunting dark past that contains a scream like in nightmares. Lo doesn't mind how things are now, but there's a slight pull to remember her past. When a boy falls into the ocean and Lo and Celia both help save him. That's when the connection between the two girls starts. Maybe Celia's power was given to her for just this reason. The only question for Celia is can she trust Lo? For Lo, she has to decide if something so dark is worth remembering. This story pulled me in almost immediately. I love a good underwater tale. I felt like I should have reread The Little Mermaid before reading this so that I could have seen the similarities and contrasts better. I really enjoyed the character of Lo. Her battles and her mind were just very fascinating. I love when a character needs to sort of rediscover their past. The thing I really love about these fairytales retellings by Jackson Pearce is the subtle way they are all connected. With each new addition to the collection you get to see a little more of the interconnecting storyline. She gives the reader just another hint at what is going on behind the scenes in each tale. I didn't really love Celia as a character, and her sisters weren't featured enough to really get a good sense about them. I felt like her sisters faded into a snobby background. Celia was just sort of mildly annoying. I'm not sure what it was about her, but she was just a bit too eager or something like that. 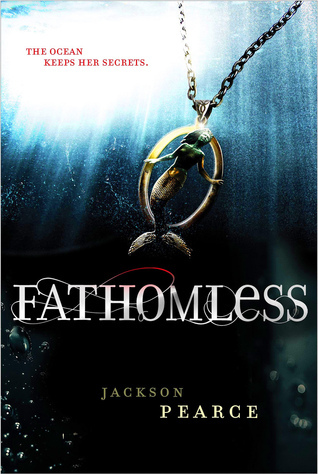 If you want a different kind of fairy tale, or a different kind of mermaid story definitely add this one to your list. I still need to read Sisters Red, but I seriously recommend reading both Sisters red and Sweetly before this one, just so you can see that connection between the stories that is just so intriguing. "There are lights at the surface." "The house, the twilight, the scent of rot mingling with something sweet cooking on the stove."